The bleak drama and morbid comedy of an Alex Potts comic is a singular reading experience. 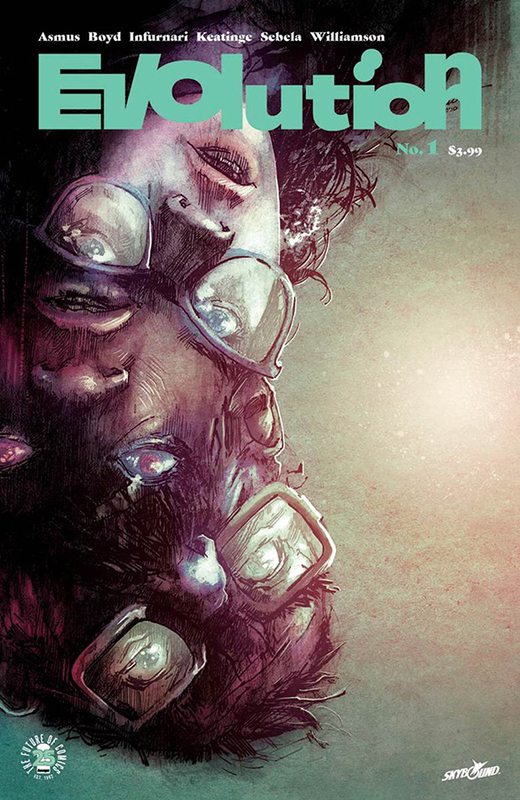 Whether it’s via his short strips in collections like Underpants or A Quiet Disaster, the comic that arguably brought him to a far wider audience thanks to Avery Hill Publishing, there’s a cadence and a tone to his work that is quite unlike anything else out there. 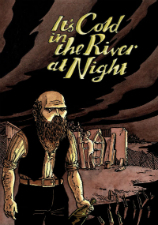 His new offering It’s Cold in the River at Night is his first longer-form work – perhaps more graphic novella than graphic novel – but a one-shot offering that will hopefully see his transition from one of the UK’s best kept creative secrets to one of its emerging stars. 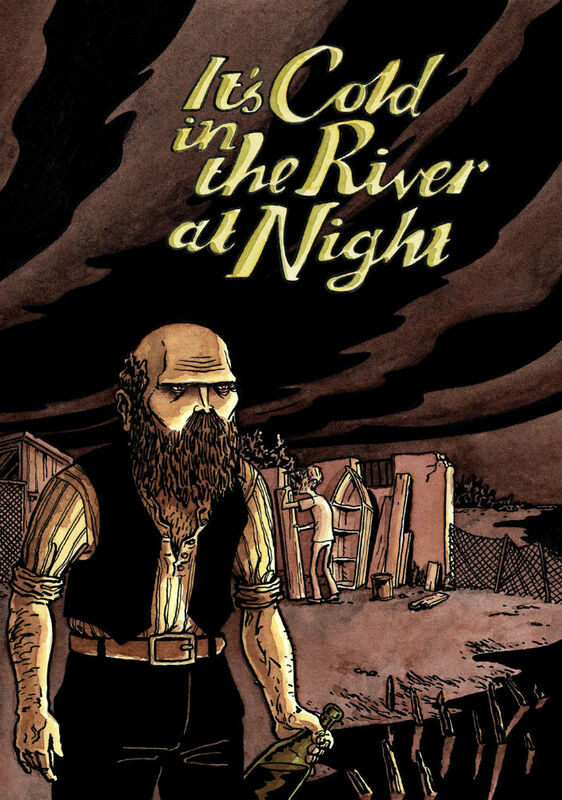 It’s Cold in the River at Night is the story of Carl and Rita, whose relationship begins to show ever-growing signs of strain during their stay in a river-situated house-on-stilts in Western Europe. Carl’s erratic behaviour will lead him into the apprenticeship of a craftsman responsible for a bizarre local tradition in another disquietingly brilliant piece of Potts-ian existential angst. Look for a review on BF in the not-too-distant future. After the positive reception of last year’s long-awaited first volume of reprints from the much-loved ’70s UK weekly supernatural comic for girls comes this second offering, re-presenting one of the most memorable serials from the cult comic’s run in its entirety. Hannah Berry and Ben Willsher updated Misty comic strip ‘The Sentinels’ with a topical twist in last month’s Scream! 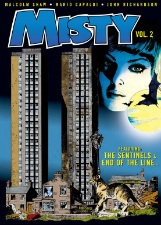 and Misty Halloween Special to chilling effect. 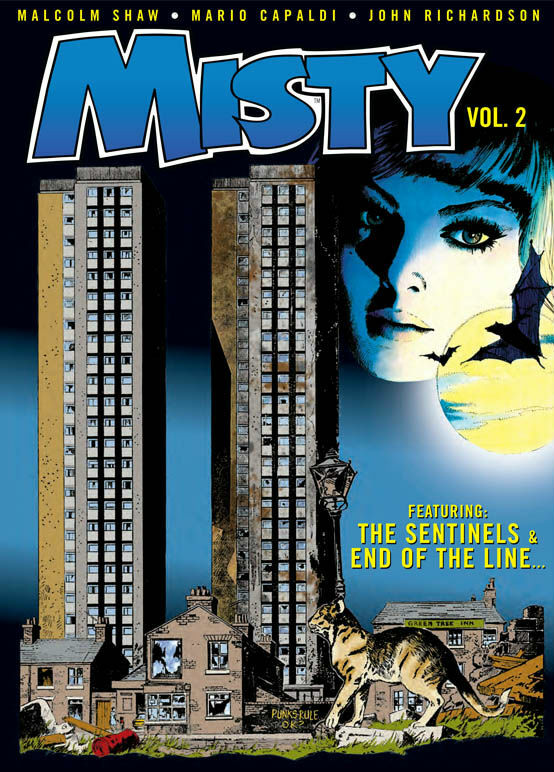 The original is republished in these pages with a chance to revisit its dark tale of an abandoned tower block that also acts as a portal to a parallel world where the Nazis won the Second World War. Also printed in its entirety in these pages is ‘End of the Line’, another era-crossing tale involving a plucky schoolgirl, the London Underground, time-displaced workmen and a Victorian villain. A further eagerly anticipated collection from Rebellion’s wonderful Treasury of British Comics series. The in-fighting god-like pop geniuses of The Wicked + The Divine reach terminal velocity in the final instalment of the ‘Imperial Phase II’ story arc. You didn’t think there could be any more dramatic, last-minute plot twists, back stabbings and sordid revelations after everything in the last 32 issues? Well, you’re probably not familiar with behind-the-scenes of most pop stars. Imagine the bloodshed if all the backstage shenanigans the Sugababes have gone through had mythic superpowers added to the mix. 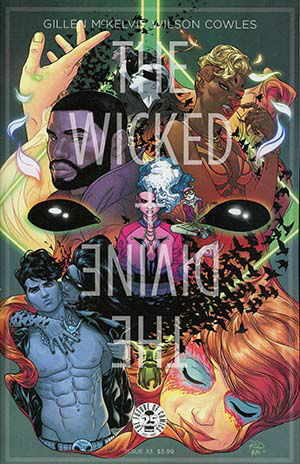 With Gillen’s characteristic tight plotting and willingness to let awful things happen to his characters (often facilitated by a willingness to let his characters do awful things to each other) and McKelvie’s consistently clean, clear and captivating art — as adept at the nuances of the ensemble’s facial expressions in close-up as he is in widescreen comic book brawls, aided by the effervescent colour work of Matt Wilson — expect the soundtrack to this issue to be less Rihanna, more Drowning Pool. In their tenth anniversary year SelfMadeHero have proved time and time again just why they’re one of the most vital and important forces in graphic novel publishing in the UK with high profile releases like The Corbyn Comic Book, Tillie Walden’s Spinning and Reinhard Kleist’s Nick Cave: Mercy on Me biography. 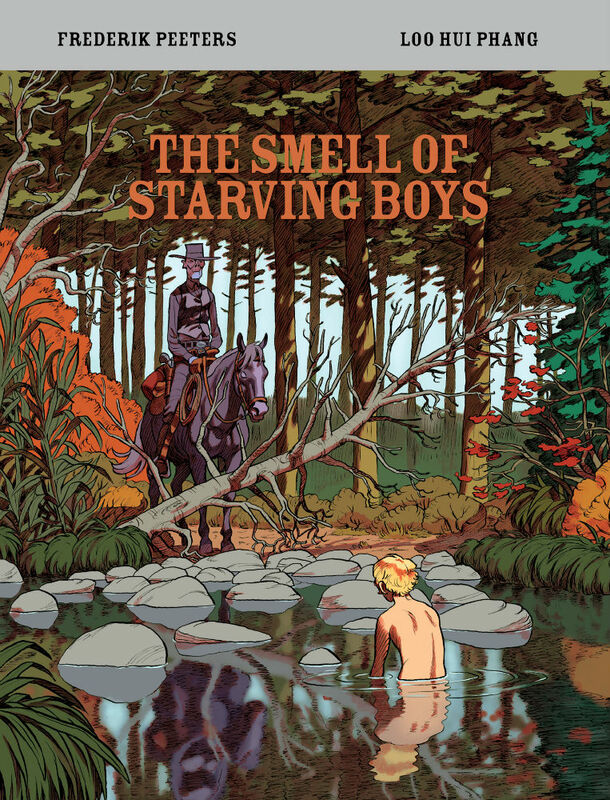 This week sees their final release for 2017 in the shape of Frederik Peeters and Loo Hui Phang’s The Smell of Starving Boys – the story of the intimate relationship that forms between a photographer and his assistant set against a post-Civil War Texas backdrop. 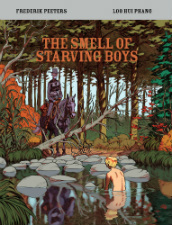 You can read a preview of the book here at Broken Frontier this week. It’s not often you see four writers collaborating on a single storyline, especially with a sole artist (plus colorist) weaving it all together into a single visual narrative. Human evolution has progressed steadily and slowly up until this point, but now we’re about to see a rapid jump into something new! Around the world, humanity is undergoing rapid changes, and only three individuals seem to notice. But is there anything they can do about it? 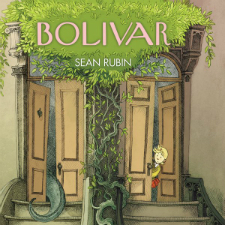 If you’re already looking for Christmas gift ideas then Sean Rubin’s debut graphic novel looks like an all-ages treat that could be pencilled in as potential stocking stuffer material nearer the end of the year. 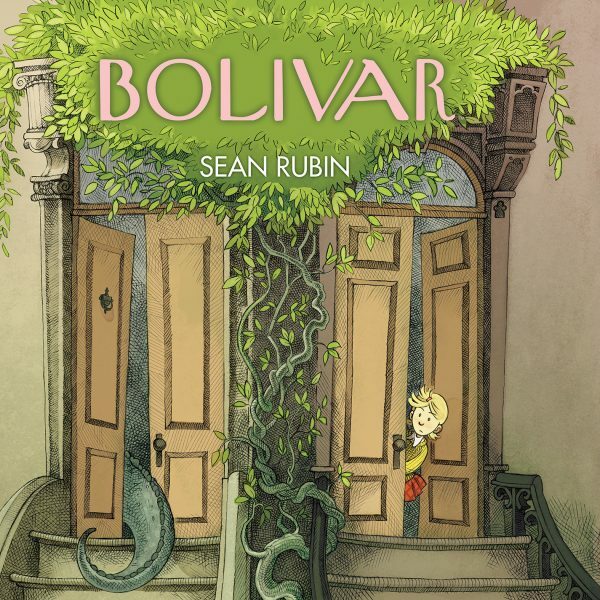 Set in New York, this hardcover edition tells the story of Sybil, the only person in the entire city who seems to have noticed that there’s something very odd about her next-door neighbour – he’s a dinosaur! Previews on the BOOM! Studios site indicate that this is one gorgeously illustrated offering with a comics/children’s illustration crossover vibe to it. You can check out some sample pages here. BOOM! Studios debuts a fencing-based new series this week from novelist C.S. Pacat (Captive Prince) and artist Johanna the Mad (the Mexican-based artist, not the sixteenth century queen of Castile and Aragon). Possessing raw instinct for the sport but lacking proper education, Nicholas Cox is an outsider in the world of competitive fencing. When he signs up for a competition, he’s up against fencing prodigy Seiji Katayama and on a path that can take him to the elite all-boys school, Kings Row. If he can make the cut, it’s an opportunity to be part of a real team and have a place to belong. As part of their latest wave of numbering, renumbering and denumbering shenanigans, Marvel have been bringing back some long-cancelled comics for an “extra” final issue as part of ‘Marvel Legacy’. 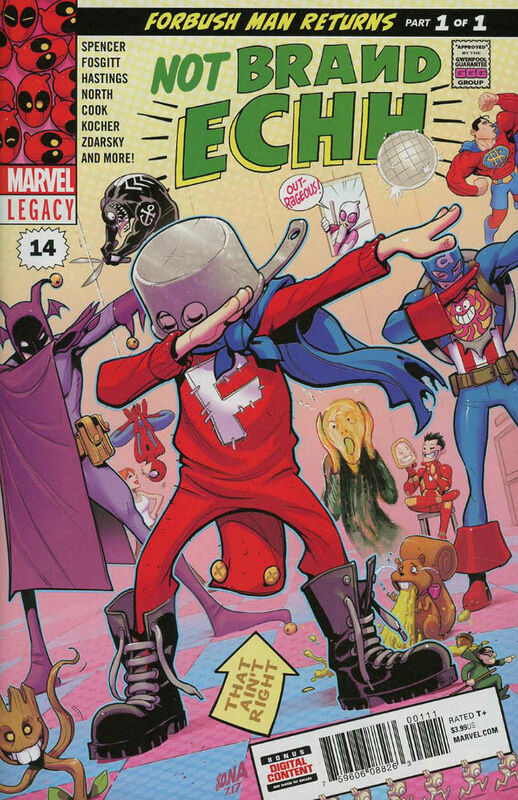 This week sees one of the more obscure Marvel titles of the 1960s finally get a fourteenth issue when their parody series Not Brand Ecch – home of Forbush Man that forgotten stalwart of another era of the House of Ideas! – makes the briefest of returns. Expect satirical takes on a whole host of super-heroic favourites as Forbush Man returns to claim his rightful place in the comics pantheon. Ryan North, Erica Henderson, Chip Zdarsky, Katie Cook and many more creators take part in this anthology-style spoof.